The authors report their research in Nature Biomedical Engineering, in a paper entitled “Nanoparticle Delivery of Cas9 Ribonucleoprotein and Donor DNA In Vivo Induces Homology-Directed DNA Repair.” Prof. Murthy, together with UC Berkeley co-authors Kunwoo Lee, Ph.D., and Hyo Min Park, Ph.D., have set up a company, GenEdit, to develop the CRISPR-Gold technology for use in humans. There are two basic categories of gene editing to which CRISPR/Cas9 gene editing could potentially be applied in a therapeutic setting, the authors explain. The first, based on nonhomologous end joining, aims to permanently silence disease-causing genes by inducing indel mutations. The second, based on homology-directed repair (HDR), aims to correct disease-causing gene mutations back to their wild-type sequences. Although the use of CRISPR/Cas9 to correct mutations via HDR has the potential to “revolutionize” the treatment of genetic diseases, in practice the approach is challenging because HDR-based therapeutics would need to simultaneously deliver the Cas9 protein, a guide RNA that directs Cas9 to the correct gene, and donor RNA, they note. The most advanced of the current potential delivery systems based on adeno-associated viruses (AAVs) can’t be used universally because a large proportion of the human population has pre-existing immunity toward AAVs, while AAV-based Cas9 delivery also has the potential to cause significant off-target genomic damage. There are similarly challenges associated with the direct delivery of Cas9 ribonucleoprotein (Cas9-RNP) using vehicles such as lipofectamine and polyethylenimine. In contrast, the CRISPR-Gold delivery system comprises gold nanoparticles (GNPs) conjugated with DNA, which are complexed with the donor DNA, Cas9-RNP, and an endosomal disruptive polymer, poly[N-(N-(2-aminoethyl)-2-aminoethyl] aspartamide [PAsp(DET)]. When injected locally, the nanoparticles are recognized by cells and are readily internalized via endocytosis. The PAsp(DET) polymer then triggers endosomal disruption, so that the CRISPR-Gold nanoparticles are discharged into the cytoplasm, where the Cas9-RNP and donor DNA are released from the nanoparticle gold core. The UC Berkeley-led team has now shown that the CRISPR-Gold system can be used to deliver all the components required for CRISPR/Cas9-mediated HDR directly to a wide variety of therapeutically relevant cell types, including human embryonic stem cells, human induced pluripotent stem cells, and bone-marrow derived dendritic cells, as well as myoblasts from the mdx mouse model. Using the CRISPR-Gold platform, HDR efficiency was typically 3% to 4%, and there was minimal off-target DNA damage. “CRISPR-Gold is the first example of a delivery vehicle that can deliver all of the CRISPR components needed to correct gene mutations, without the use of viruses,” Dr. Murthy states. Having demonstrated the technology in cells, the team then turned to the mdx mouse model of DMD as a therapeutic test case for CRISPR-Gold. In humans, the muscle-wasting disease is caused by mutations in the dystrophin gene, and about 30% of patients have single base mutations or small deletions that could feasibly be corrected using HDR-based strategies. However, the only current gene-editing strategy for treating the disease is based on nonhomologous end-joining–induced exon skipping, which generates a shortened form of dystrophin that is only partially effective, the UC Berkeley team notes. In contrast, a single intramuscular injection of CRISPR-Gold in mdx mice led to 5.4% of the mutated dystrophin gene being corrected back to wild type. This rate of correction was 18 times better than when the Cas9-RNP and donor DNA were injected on their own. Muscle tissue injected with CRISPR-Gold also demonstrated robust dystrophin protein expression. 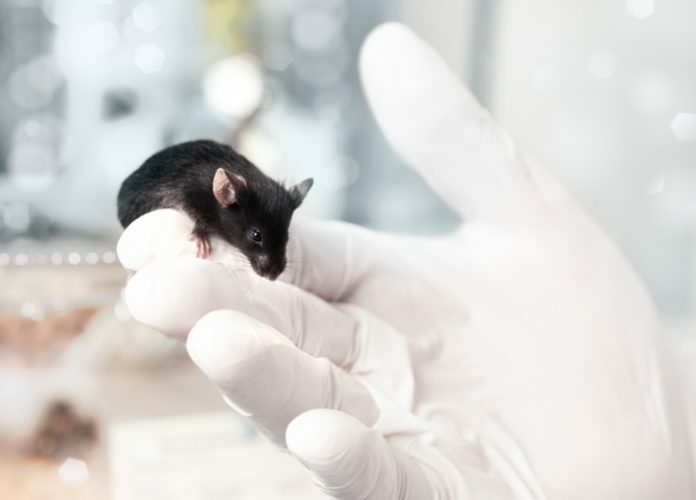 And when compared with control animals, the CRISPR-Gold-treated mice showed a two-fold improvement in hanging time in a four-limb hanging test. Encouragingly, when the team then carried out deep sequencing analysis, they found that the degree of off-target DNA damage caused by CRISPR-Gold was no different from the levels of sequencing error (0.005–0.02%) found in a typical cell that hadn’t been exposed to CRISPR-Gold. “These results demonstrate that CRISPR-Gold can induce HDR in muscle tissue with minimal off-target genomic damage, effectively edit the dystrophin mutation in mdx mice to the wild-type sequence, and improve animals' strength under clinically relevant conditions,” the team claims.